This is a semicolon while it’s probably familiar to you its use might be a little confusing it's kind of a punctuation hybrid half comma, half period thing. Think of it as the Centaur of the grammar world it's hybrid nature makes it stronger than a comma but not as final as a period. But what exactly does it do? should we even trust it? well it has a number of uses first off it's one of the ways to connect two independent clauses. Now I know what you're thinking there are so many ways to connect two independent clauses but let's look at these two. My roommate doesn't like ice cream. My favorite ice cream is mint chocolate chip. If you want to join these two sentences also known as independent clauses you can add comparison through a subordinate clause. Although my roommate doesn't like ice cream, my favorite ice cream is mint chocolate chip. Or by using a comma paired with a coordinating conjunction: my roommate doesn't like ice cream, but my favorite ice cream is mint chocolate chip. But if you use a semicolon the connection is more ambiguous. Instead of making a comparison the writer is using a semicolon the mystery connector. The writer is giving the power to the reader to decide how the two are related and with great power comes great responsibility. Another great way to use a semicolon is to separate items on lists when those items contain internal punctuation such as commas as in this example: I have lived in Chicago, Illinois; Miami, Florida; New Orleans, Louisiana; and College Station, Texas. Moving is the worst! With all these commas it's hard to tell what goes together and what is separate so we use semicolons. Here semicolons are more like super commas that provide even more separation than a regular comma. These super commas can also be used in lists that contain long phrases or complete sentences such as I decided to go to Texas A&M for three reasons: first I love the Aggie Traditions; second I wanted to learn about leadership; and Third I got a great scholarship. As you can see semicolons can handle a lot. Now these bulky guys handle things differently from colons so don't get them confused. Colons are more like butlers at fancy dinner parties in that they announce and introduce things in fancy accents. The colon can be used to introduce a quote such as in Remains of the Day the butler Stevens admires his workplace in this line the English landscape at its finest possesses a quality that the landscapes of other nations inevitably fail to possess these guys can also introduce a list she told me to visit three places Paris, Rome and Prague. Like butlers colons are handy to have around for all sorts of grammatical housekeeping was time for example the colon is used to separate hours from minutes or colons can be used to separate the volume from the page numbers in cited works. 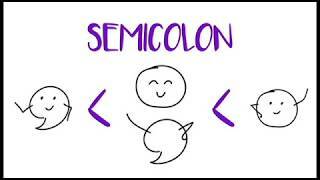 So keep these things in mind when using a colon or semicolon since they're both connectors in their own way. But if you have any questions you can always visit us at the University Writing Center.